Upplev en av världens mest kända universitet på en 1,5 timmars vandringstur i det prestigefyllda Cambridge University. 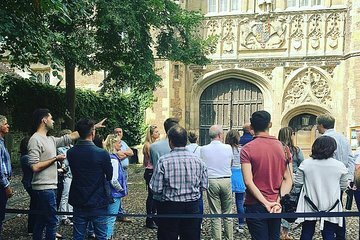 Följ din guide, en Cambridge University student, runt arkitektoniska höjdpunkter som Trinity College, King's College och Corpus Christi College; se hallarna där alumner som Sir Isaac Newton, C.S. Lewis och John Harvard en gång gick; och kikar in i studentstrider som The Eagle Pub. Denna gruppresa är begränsad till 20 personer för en personlig upplevelse. Our guide, Jay was very knowlegeful and kind to accommodate our requests to spend more time on particlar spots. We throughlyenjoyed the walk though it was raining thanks to Jay who oprived us with interesting informatin about Cambridge. We enjoyed our short 1-1/2 hour tour of Cambridge with one of the students. We saw quite a lot of the campus. There are a lot of small alleys on campus and it would have been difficult to find our way around in an efficient manner. It's a good introduction to Cambridge University life and it's history. Good pace and enjoyable with a knowledgeable guide. Alex was a very nice young man who certainly knew his stuff. He was studying for his PhD at King’s. He did get a bit star struck when he met Alasdair Campbell who was filming outside St Mary’s. Lovely informative tour pointing out the main Colleges and walking round the Backs with a Ph.D student. However this tour does not get you into any parts of the Colleges that you could not go into on your own. If you want to go into Trinity,Kings,St.Johns you have to pay - these are not part of the tour. We were a group of 4 individuals and our guide was a student there at Cambridge. we thoroughly enjoyed our tour and would highly recommend! Fantastic Experience. Enjoyed it very much. The guide was very knowledgeable. thanks. The tour guides told us her personal experience and the gems that I would not notice a typical Cambridge tour. She was a past Cambridge grad and was also motivated in leading a great tour as well. I felt welcomed during this tour. If you love learning about the local cultures and a book lover, you must go on this tour.